Its passengers were hit by cancellations and delays just one day after it was named the UK's second-worst operator. Britain’s train operators aren’t exactly known for their good timekeeping. According to Network Rail figures, just 64.9% of services arrive early or less than one minute late. But you’ve got to hand it to Southeastern Trains, which apparently has a fantastic sense of timing. Yesterday it was named Britain’s second-worst train company in a survey of 28,000 passengers. And today its customers were hit by cancellations and severe delays after an electrical failure. To be fair to Southeastern that’s actually the fault of Network Rail, whose equipment damaged the conductor rail that supplies power to trains. But that won’t ease the fury of Kent commuters who already have to put up with a patchy (some might use more creative language) service. 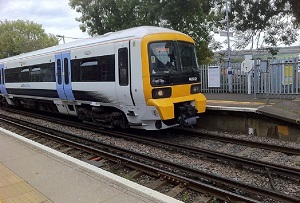 Yesterday’s survey found that just one other operator, Thameslink, had a lower proportion of satisfied customers. Southeastern put on a brave face, pointing out that its satisfaction rating was at a dazzling ‘two year high’, and that its reputation for cleanliness and customer satisfaction with access to information were both on the up. But satisfaction with punctuality, frequency and connections were all down by 5% or more. And let’s be honest, those are the things that matter - better to be on an untidy train that actually gets you where you want to be, when you need to be there, than a gleaming carriage crawling through the home counties like an injured (if well-groomed) sloth. Today’s delays aren’t the first major problem Southeastern has had this year. Its services were disrupted a couple of weeks ago after more than 200 tonnes of trees and soil slid onto a line near Barnhurst. And separate delays caused by ‘bright sunlight’ certainly raised a few eyebrows. Given the poor service many of them get on the railways, it’s no surprise that many of London’s commuters welcome the news TfL will be taking over all of the capital’s suburban rail services in the coming years. But considering many of these problems aren’t all directly Southeastern’s fault, there’s no easy answer to the problems afflicting Britain’s railways.